The SF PHP Community Meetup is an open forum where PHP developers of all skill levels can come to communicate, learn, network, or just have a good time. We meet on a monthly basis and generally have speaker from the major web site companies in the bay area. Lively discussions or Q&A for hours afterwards. Our focus is in the PHP world but our topics encompass the entire LAMP stack. Topics include PHP coding, to memcached handling, db optimizations, server stack, web server tuning, code deploying, hosting options and much much more. We are actively seeking speakers and sponsors for upcoming monthly meetups. Please contact the organizer through Meetup message. 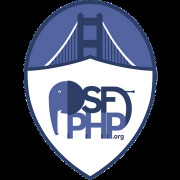 The purpose of SF PHP Community is to present public events that are beneficial to the PHP community and to help nurture the growth of the community through education, networking, mentoring, and friendship. SF PHP meetups are a 'safe space' or to put it another way a 'flame free' zone. In order to grow the community in a responsible way we actively encourage diversity and respect. Although we are just one meetup group in one city we have the opportunity to present a positive and energetic vision of what can be built with PHP now, and where PHP is going. By educating in current techniques and practices, we also inspire people to create new solutions. By bringing developers together in person, we make it easier for new connections to be made. All of this in turn brings renewed energy and people to the language, our projects, and frameworks.